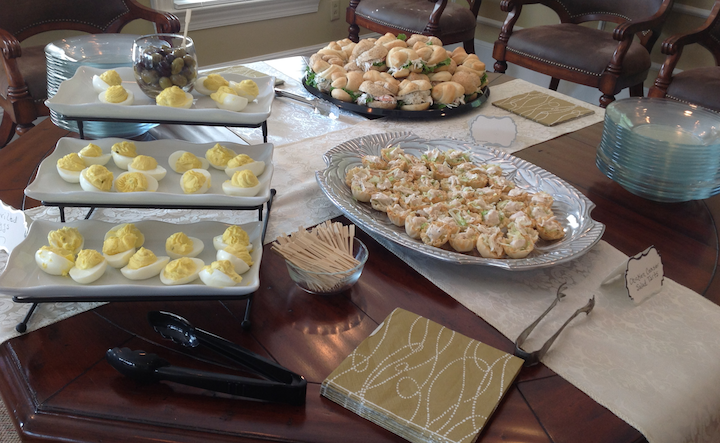 For our recent pretty southern bridal shower, one of our hostesses came up with this recipe. It’s so simple, the presentation looks great in the phyllo cups, and they are tasty too. This recipe yields 60 of the Chicken Caesar Salad Cups. You’ll need. Cook chicken and shred (it should yield at least 2 cups of cooked chicken). Fill squirt bottle with Caesar dressing. 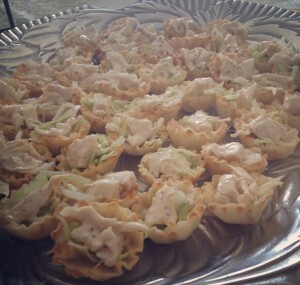 Place shredded lettuce in phyllo cups. Top with the cooked chicken, then add a drizzle of the dressing. Arrange cups on a platter and serve! Chicken Caesar Salad Cups with Deviled Eggs and Mini Sandwiches. A perfect spread for a Southern bridal shower.